Dinnertime as we know it is being disrupted. A new crop of trailblazing companies are challenging the way consumers think about grocery shopping, and tempting them with first-class ingredients and restaurant-worthy recipes delivered straight to their doorstep. It’s a win-win situation for both shoppers and service providers: time-starved consumers get the convenience they crave, and meal-kit companies get to collect data on their dining preferences. According to multiple sources, the flourishing sector is growing in both size and popularity. It comes as no surprise then that an increasing number of grocery retailers are hoping to make their own mark in the meal-kit industry, with some in talks of acquisitions, while others build their own homegrown offerings. For busy shoppers, meal-kit services offer a means to provide wholesome, home-cooked meals for themselves and their families in a way that won’t eat up too much of their precious time. These practical services ship recipes, cooking tips and, most importantly, the exact amounts of ingredients required, in a convenient, pre-packaged box—and consumers are buying into the concept. In fact, according to research by Nielsen, one in four adults in the U.S. has purchased a meal kit in the last year, and 70 percent continue to buy them after making their first purchase. The reason for this explosion can primarily be attributed to the element of convenience. With these services, once the shopper has signed up and indicated their preferences, their meal boxes arrive regularly—all they have to do is unpack the ingredients and cook them. Also part of the equation is the growth in unique dietary preferences. Many of the solutions offer vegetarian, low-carb and vegan-friendly options, and some boast their locally-sourced, organic foods. This means that by subscribing to these plans, consumers are able to stick to their dietary resolutions more effectively. Packaged Facts, a food and beverage market research firm, estimates that there are now more than 100 meal-kit delivery services available in one form or another, from those that deliver pre-made, microwavable meals, to ones that specialize in juice cleanses. But for all its potential, the meal-kit business isn’t without its risks. In fact, its main threat is one that’s now familiar to retailers across the country—champion disruptor, Amazon. The eCommerce behemoth filed a trademark application for prepared food kits in July, sending shares of New York-based meal-kit company, Blue Apron, dropping by as much as 12 percent. However, as a convenient meal solution that shares so much with the prepared foods that have grown in popularity in recent years, meal kits are proving to be an organic fit for grocery stores—a fact that has been further substantiated by Albertsons’ purchase of another New York-based meal-kit service, Plated. The deal—which marks the first acquisition of a prepared-meals company by a national grocery chain—gives Albertsons the expertise and brand recognition of a leading meal kit company with powerful technology and data capabilities, while Plated gains access to 2,300 stores and the financial support of one of the largest supermarket chains in the U.S. Even so, these services appear to be gaining more and more traction, with the sector reportedly soaring to $5 billion in sales. For this reason, there’s a sense of growing trepidation among retailers about what the rise of meal-kit solutions could mean for the grocery industry with its famously low prices, thin margins, and increasing competition from online and big-box retailers. Sylvain Perrier, president and CEO of Mercatus, suggests that rather than viewing the growth of these services as a threat, grocers should consider the transformative potential they might offer. “I believe that the growing demand for meal-kit solutions may help the adoption of online grocery,” he explains. “They represent an opportunity for retailers to rethink their approach to shopper convenience and the grocery experience as a whole. This could come in the form of supermarket chains strategically partnering with meal-kit service businesses, or even acquiring them outright—like we’ve seen with Albertsons," he says, adding that the purchase was likely a calculated move for the retailer as it shifts its focus to innovation and personalization. Another approach retailers are taking is by creating their very own homegrown meal-kit solutions, such as Kroger’s “Prep + Pared” and “Aprons” by Publix. In doing so, they have the ability to capitalize on their strong reputation for their fresh-focused food formats, lending credibility and trust to their new meal-kit brands from the very beginning. Do you plan to focus on single, professional households or families with kids? Are you after the foodie or the time-conscious convenience eater? Will you cater to dietary preferences by providing gluten-free and vegan-friendly options? Do you plan to create a selection that appeals to shoppers who enjoy cooking, or those that hate it? Meal kits are primarily a solution for busy, time-starved shoppers, but it’s still just as important to cater to those who enjoy cooking. With this in mind, be sure to offer a healthy selection of fresh, prepared products and convenience ingredients for those who aren’t just after that quick fix. Your meal-kit service is less likely to be successful if the kit itself is more expensive than the combined price of the ingredients when purchased individually. While this might be a common trait among meal kits, if your customers choose to shop with you because of your low prices, meal kits charged at a premium probably won’t resonate with them—no matter how convenient they may be. The success of any meal-kit program will be highly dependent on the quality of your fresh produce items. If shoppers are unsure about the standard of a retailer’s meat or produce, they’ll be skeptical of its meal kits. Will your meal kits be one-off purchase items, or will they be available via subscription? Will shoppers have the option to order them ahead of time via an online service and then pick them up in store, or will you offer delivery? These are all important considerations to make. For example, if you plan to offer a subscription service, home delivery will likely be an important feature that's vital to the program's success. A growing number of grocers are developing their own meal-kit solutions or partnering with established players. Acquisitions are an appealing option for many as they expand not only a retailer’s footprint, but also its customer base. As consumer interest in meal-kit solutions continues to grow, grocers have a unique opportunity to piece together the same components and market them at an affordable price to capitalize on this growing demand. 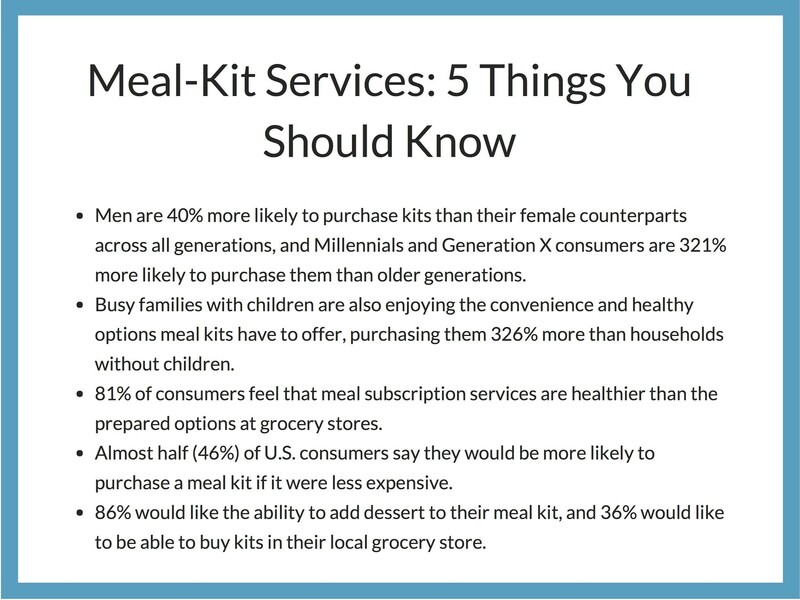 In the months and years ahead, it’s likely that an increasing number of retailers will acquire leading meal-kit service providers. Meanwhile, those who have the scale, resources, and equipment in place will likely develop their own offerings. Whether your brand opts to get on the meal-kit bandwagon or not, the burgeoning trend might just be a positive one for the grocery industry. Why? Because it helps break down the barriers of consumer acceptance as we rethink the way we eat and shop, and become more comfortable with buying food online. For some grocers, meal kits could be the missing ingredient to their retail strategy. To learn more about the latest trends in grocery and find out what you can do to ride the digital wave, download our Survival Guide to Digital Retail.